Dr. Gwen Ladd Hackler was awarded a trip to the UK for two as a token of appreciation for the over ten million dollars in grants she has written for the university during a reception in the Hearth Room on October 3. The reception celebrated the continued funding of SNU’s McNair Scholars Program and Hackler’s contributions to the university. The atmosphere in the room occupied by several dozen faculty and staff members and a handful of current students was festive. A poster at the front of the room read “Ten million reasons to be thankful for Gwen Hackler.” Attendees mingled and ate refreshments while a guitar player provided background music until the ceremony began at 4:00 p.m.
Gresham explained that SNU was one of only three universities in Oklahoma receiving this funding, the others being East Central University and the University of Oklahoma. This grant also marks a milestone for Hackler. 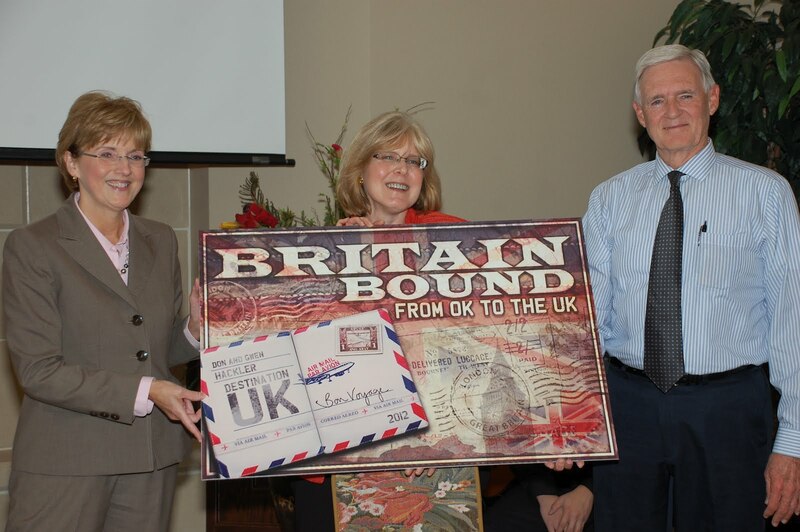 In recognition of her achieving this significant landmark, Jones and Gresham presented Hackler with a poster stating “Britain Bound: From OK to the UK.” They explained that Hackler and her husband would be receiving a trip to the UK as a token of appreciation. Hackler and Dr. Rhonda Crutcher, SNU McNair Scholars program director, were quick to point to others’ support as important in winning continued support for the McNair Scholars Program. Hackler listed many individuals and campus offices that were instrumental. While some such as Academic Affairs and Institutional Research were fairly obvious, others such as the library, Career Center, and Facilities Management (and many more) were also thanked, showing the wide involvement throughout the community. “One of the biggest reasons we qualify is the across-the-board support we receive from the campus because they care about the students as much as we do,” Crutcher said. McNair Scholar and SNU alumna Lauren Brand (Class of 2010) spoke to the audience about her experiences with the program and Hackler. “I was a sophomore taking Shakespeare with Dr. Hackler when she told me about this new program,” Brand said. Brand said she did not initially know what graduate school was, but as she learned more about it, she became interested. “I was interested in grad school, but wouldn’t have known what to do if not for the [McNair] program,” Brand said. Brand said the McNair program helped her in preparing for graduate school and applying. She is now ABD (all-but-dissertation) at Rice University in Houston, TX. Studying history, her dissertation examines Indian Territory during the Gold Rush. Several current SNU McNair Scholars were also at the event. “McNair has been awesome. It’s given me a chance to do research on a topic I love and travel around the US to present. It leaves me more prepared and confident for grad school,” senior sociology major Dezzarae Flynn said. “[The McNair Scholars Program] is very educational. Much like [Brand], we don’t always know what to expect coming into college. It’s inspirational to hear stories of success. It’s amazing,” senior multi-disciplinary (business and English) major Kevin Noriega said. She is doing acadamic as well as financial service to the university..